A point worth noting is that the horizontals in the Ennis corner windows were to be on an 8-inch module (two per block) rather than 16 as at Freeman. See the 3rd and 5th drawings in SDR's post of Friday the 29th, 2:07pm. 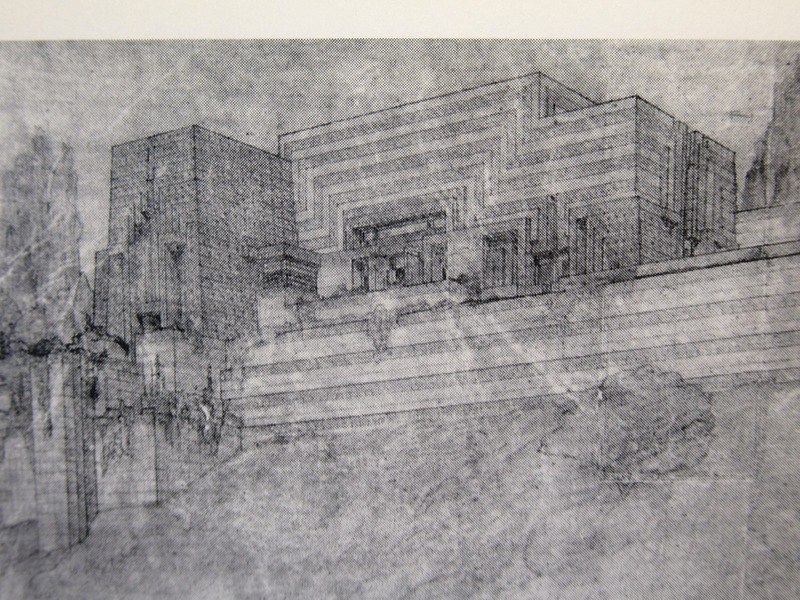 When he used a photo of Ennis in In the Nature of Materials, Wright penciled in the bars (at 16 inches). Aha -- good one. They even appear in the small-scale section drawing at top of post. and taller closet door -- as if drawn on rubber, or subjected to digital manipulation of the simplest kind. How embarrassing. I meant to say In the Cause of Architecture: the Meaning of Materials, but now I can't find it there either, in the Rizzoli Collected Writings. Must have been some other edition. 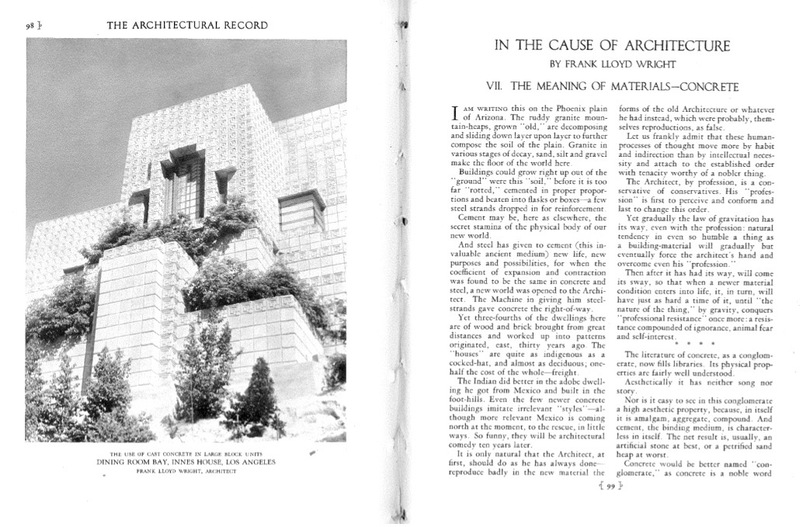 One of the touched-up photos is on p. 127 of Terry Patterson's Frank Lloyd Wright and the Meaning of Materials. Are there any covenants attached to the sale? Does the buyer have to maintain the house as is? I'd hate to see some billionaire tear it down. The main feature of the ground floor is (you guessed it) a billiards room, shown in the photos earlier in the thread looking NW toward the entry hall. It was originally unfinished storage, which Wright finished for the Nesbitts in the early 40s, adding the fireplace. You'll notice that it contains no patterned blocks. The S side, not visible in the photo, is mostly glass doors. They are the only glass that has the horizontal mullions as designed. There is also a powder room at the bottom of the stairwell, N side of the entry, and a laundry room on the S side of the entry, just W of the billiards room. Note that in the living and dining rooms, boards form the ceiling, the canted walls are blocks, and the battens run across both the ceiling and block walls to make a connection. See the longitudinal section of the dining room above. SDR, the ceiling in Mabel's room was designed to be flat. No detail of it has been published, so I don't know the material. The transoms in Freeman were originally redwood, and were replaced by Lautner with aluminum in the 70s when they failed. The plans do not show the blocks at the corners, which may have been added to make the connection more secure. When I first saw Freeman, the aluminum was unpainted, and practically vanished in the sunlight. Later they were painted an unflattering shade of brown one might come across on an unkempt public sidewalk. The patterned closet doors are almost as designed, with no vent. Solid teak. Cajun, in Mono 4/237 is a partial plan of the entry level at the base of the stairs. The powder room in that plan was moved west, and where the PR is shown is a closet. The entry vestibule is under the pantry, and is quite roomy. (There is a glimpse through the pool room door in the Curbed photos.) Although enclosed, the vestibule was intended to be an open porch, with the entry doors (double glass) at the east end, opening onto a transverse hall, under the service hall, with the stair up at the north end, and access to the pool room at the south. To the right, under the guest room, is a laundry. The pool room is under the dining room. The space below the house from living room to master bedroom is an unfinished area with a dirt floor, about 4 to 5 feet in head height. cajunman, this note on W A Storrer's plan drawing should answer your question . . . Thanks! And so sorry I didn't see the pics on the first page....don't know how I missed that! A couple of other Ennis changes show up in the present drawings and photos. The first of the longitudinal sections, looking south, shows the hallway five blocks tall, not six as the Curbed photos show. 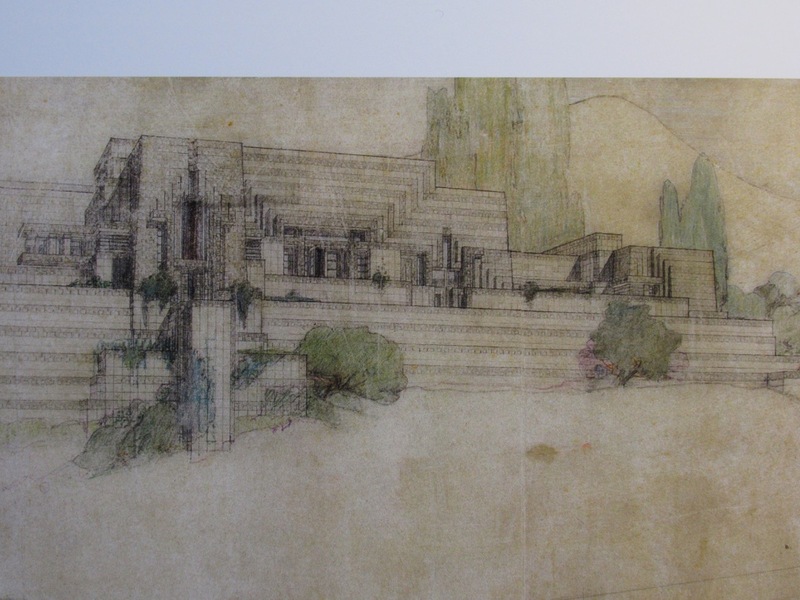 The first of the detail drawings has a view captioned N side of D.R.. The parapet is three blocks high, with openings two blocks high. The Curbed hallway photo is from the other side of that parapet. It's only one block off the dining room floor, showing in the photo as a recessed block course with a four-block opening above it. That would have made the parapet 6'8" high on the hall side. Reaching the top of the stairs, we wouldn't have seen into the dining room. 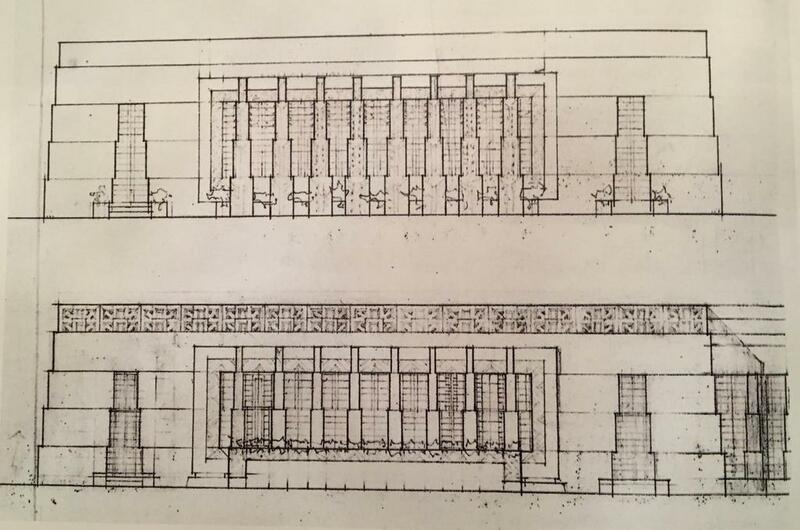 The Sijistan / Nesbitt drawing, from about the same perspective, seems to show shelving in the openings with rugs draped from them, blocking the view from the hall. I suspect he hated that worm's-eye view of the dining room that we get now. Reidy, the longitudinal drawing doesn't show the passage to the hall. That 5-block doorway is to the living room. The hallway, or loggia, was always planned to be 6 blocks high. At the point where the loggia spans the gap between Mr. and Mrs. Ennis's bedrooms, the doorways onto the small terrace on the west side was supposed to be one block lower than on the east side. The fenestration enclosing the dining room from the loggia ought to be built. 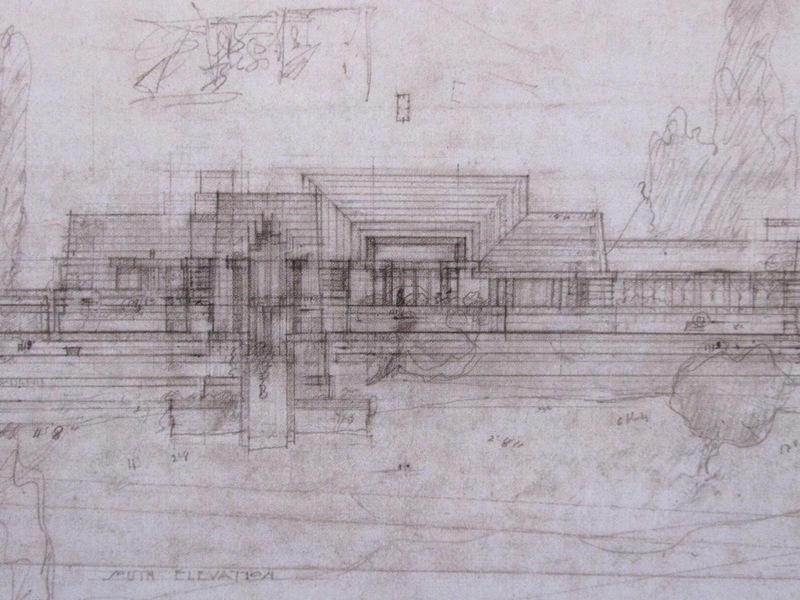 You're right about that, FLW would not have liked that glimpse from the entry loggia into the dining room. Another place where blocks are missing is between the dining room and living room, and the dining room corner windows, which should be two blocks high, not one. 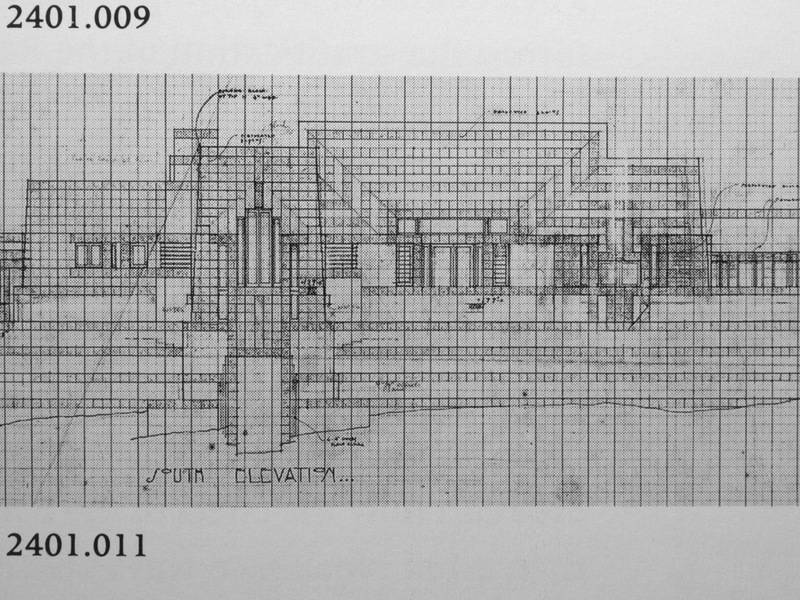 Regarding the windows in the Ennis House, Julie L. Sloan discusses the original designs in her wonderful book "Light Screens: The Complete Leaded Glass Windows of Frank Lloyd Wright". She notes that "the main windows of the living areas were executed in a different leaded pattern than the one designed for it. 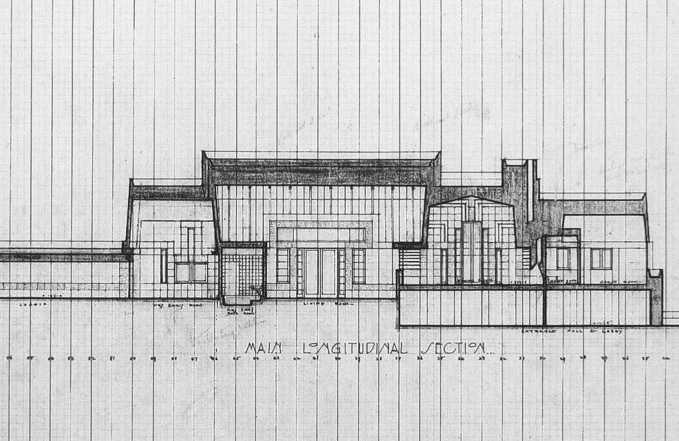 The executed design features an inverted variaion of a pattern that was later sketched in the windows of the elevations for the A.M. Johnson Shrine project." Regarding the windows in the library, according to Sloan they are not by Wright. They are nearly identical to windows in the Sedgwick Brinsmaid house in Des Moines, IA which was designed by Arthur Heun. The windows may have been designed by George Mann Niedecken and made by Giannini and Hilgart. 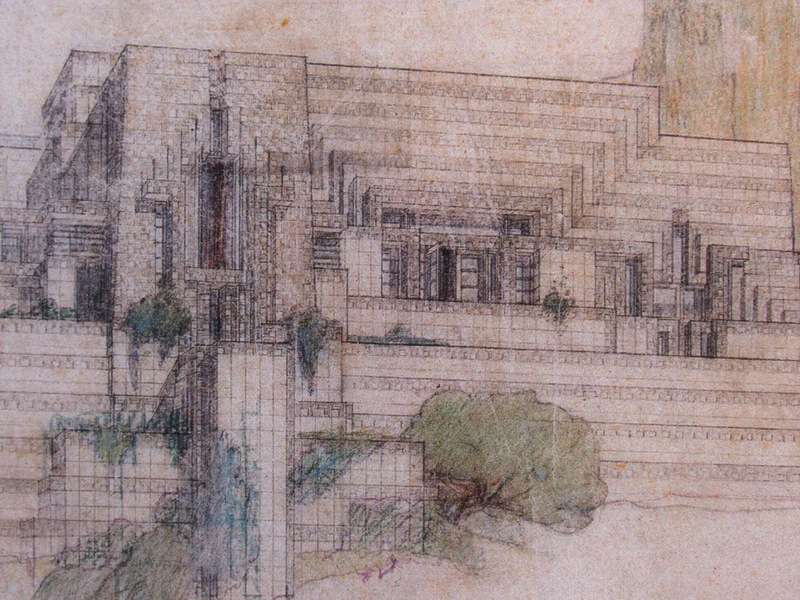 They may have been the manufacturer for the windows at the Ennis House, which would explain their presence. Am I correct in saying that the big window in the living room would have had a huge plate glass center and the sides would have had horizontal mullions? You show the A M Johnson project -- for those who have not seen it in detail. images are to be credited. glass above those doors appears to be single-pane in all of these illustrations. The major alteration of the living room window/door arrangement is the inclusion of block mullions separating the 12-block, 16' transom window into three parts. The block frame of the doors rise to transom level, turn away from the doors, over the side lights, thence surround the transom window, in a pattern as old as Minoa. Perhaps the additional blocks were installed for fear of that 16' span, but they shouldn't be there. The transom over the doors was to be plain blocks of only one unit deep, while the surround was to be two blocks deep and patterned.